On Tuesday, I visited Michelle Kaisersatt’s studio in St. Peter, Minnesota. Michelle has done beautiful pottery work for years—vases, chalices, and functional dinnerware. She’s exhibited in this area and has won numerous awards. Recently, she has made a move into creating funerary urns. She also creates keepsake memento boxes and a locket that can hold a small amount of ash. It’s the locket that drew me to Michelle’s space on Tuesday. After Kahlil died, I felt a strong need to keep something of him near me, close to my heart where he will always live. When I found out Michelle had designed a locket, I had to see it for myself. I’m glad I had an excuse to see her studio in person. 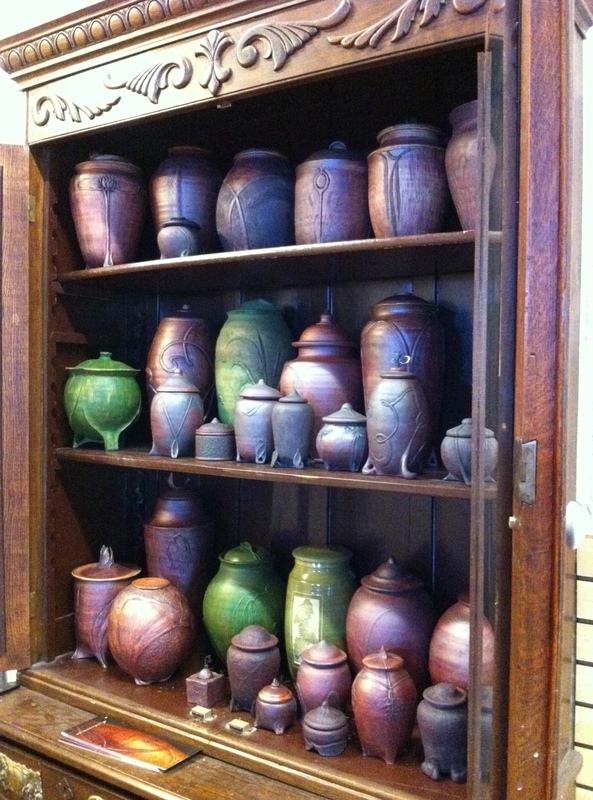 Michelle’s urns are beautifully displayed. The variety of glazes give them all a different tone and feel. In person, some of the reddish urns actually look like they’re made of cedar. But they are all clay. 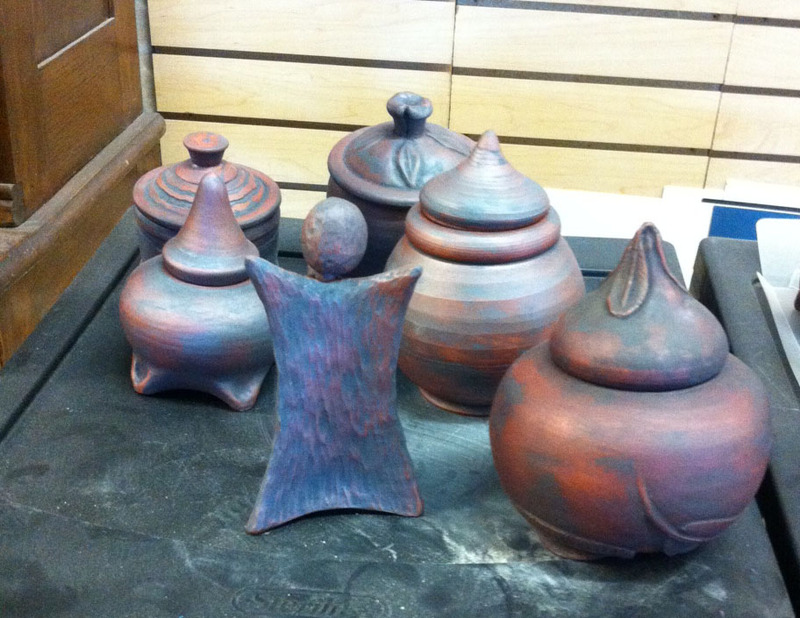 Her urns are inspired by nature; they reflect an organic shape and color. They vary in size, from small vessels that would hold a small amount of remains to large urns that are meant to keep the entirety of ashes. Michelle also makes smaller urns and keepsake mementoes. Michelle and I have something in common: our art revolves around death. What we see as very natural muse, others see as something to avoid. Now that my book has been out in the world for a few months, I’ve had a number of eye-opening realizations. I’ve had a lot of great conversations with people who have stories similar to mine. They’ve shared their stories of loss and have shared their love of cemeteries. But I’ve also seen the opposite: some people do not want to talk about these things. Michelle and I talked about the way some people hesitate to have conversations about things that surround the ritual of death—funerals, cemeteries, urns. You can look at those things and see two different things. You can see sadness, grief, loneliness, and loss. Or you can see beauty, art, colors, and hope. Maybe you see a blend of the two. But there’s a lot to miss if you overlook the things of beauty that have been created to surround this ritual. I believe it’s human instinct to want to create beauty in order to ease the pain. At least, that’s why I do it. Loss is a powerful muse. Michelle is driven to create urns, I’m driven to create a string of words. We both aim to create a type of beauty that will resonate. I think loss is the first muse; others come in time, but the tension between the pain of grief and the beauty of art always make, for me, the most satisfying “vessels” of the human experience. I love the idea of a locket–did you fine one you liked? Michelle has a beautiful locket! It will be cast in bronze. It will be ready around mid-August. I feel that if I didn’t put my energies into creating something, I would be weighed down with sadness. I find it empowering to be able to create something in order to get out of a dark place. Awesome, Rachael. It’s true–some, like me/us, we grasp everything we can. For others, death is something not to be talked about. The son whose dad died six months before my dad doesn’t even have a picture of his dad. Doesn’t want one. That’s so foreign to me. I want everything. I fall into the trap of thinking that everyone looks at the world the same way I do! LOL!